Daily Commentary – Tuesday, July 15, 2014 – What’s Going On With “The View”? 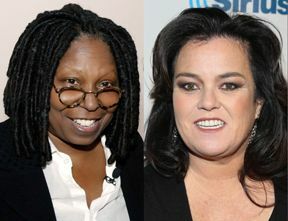 Now that Jenny McCarthy and Elizabeth Hasselbeck have been fired and Barbara Walters is retiring, all that is left is Whoopie yet we now hear Rosie O’Donnell will be returning! It will soon truly be an end of an era … Barbara Walters will reportedly retire in May, 2014. Barbara Walters, who began her TV career for NBC’s “Today” show in 1961, but became more of a household name when she joined ABC News in 1976, is reported to be retiring in 2014. The 83 year old Walters will be hanging up her microphone. It is hard to believe she is that old and has been in the industry for some 52 years. Sadly, too many people know her for her time on ‘The View’. However, as reported at Dead Line, long before ‘The View’, Walters was a trail blazer for female journalists, becoming the first woman to co-host a news program when she got behind the Today desk in 1974 and the first co-anchor of a network evening news broadcast when she joined ABC Evening News in 1976. She also anchored ABC News’ primetime newsmagazine 20/20 for 20 years. If there was an interview to get in the 1970′s and 1980′s, Barbara Walters was doing it. Personally, I believe her best work was during her days on ’20/20′ with Hugh Downs. Although I do not agree with 95% of her opinions and political beliefs, you have to respect her for her determination, perseverance and enduring legacy. Barbara Walters discusses her time at 20/20 with Hugh Downs … by far her best work ever. ABC News anchor and “The View” co-host Barbara Walters will retire in May, 2014, someone familiar with the matter tells TVNewser. ABC is expected to air a number of specials, tributes and events over the course of the next year, leading up to Walters’ formal departure. A spokesperson for ABC News declined to comment on the matter. Walters began her TV career for NBC’s “Today” show in 1961. She would go on to break barriers in what was traditionally a man’s world. Walters was the first female co-anchor of “Today,” and was the first woman to become the co-anchor of a network evening newscast. Walters had some recent health issues. We wish her well.